MxGPS is an ArcMap add-in (extension) that can communicate with Garmin™ handheld GPS units. 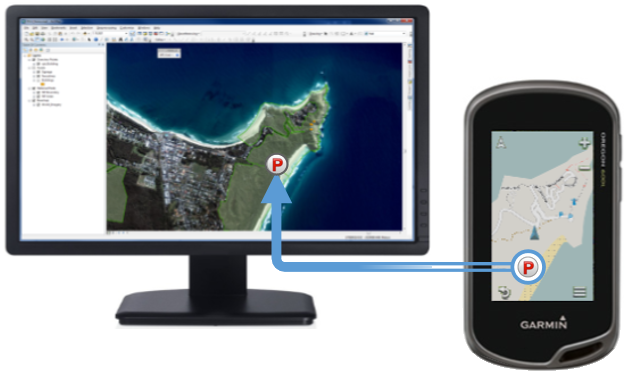 MxGPS allows you to rapidly transfer data directly between ArcGIS® Desktop software and a Garmin GPS unit. Download the add-in to see how easy it is to transfer data between your map and GPS. GPS data such as waypoints and track logs can be downloaded directly into ArcMap and stored in shapefile, geodatabase or GPX format. Downloaded data is automatically projected into the same spatial reference as the map. If required, a datum transformation is applied to ensure the best possible results. Map features such as points, lines and polygons can be uploaded to the GPS as waypoints or track logs. Simply select the layer and features that you require and click ‘Send to GPS’. The data will then be available on the GPS unit. MxGPS requires ArcGIS Desktop (Basic, Standard or Advanced) 9.2 or above - ArcGIS version 10 is recommended. Garmin GPS units can be connected using a serial (COM port), USB or as a USB Mass Storage Device. Specific requirements can be found on the download page. Manage waypoint symbols and create rules on how symbols are handled when downloading data or sending data to a GPS unit. ArcMap and ArcGIS are registered trademarks of ESRI in the United States and/or other countries. Garmin is a trademark of Garmin Corporation in the United States and/or other countries. Spatial XP is not affiliated with ESRI or Garmin Corporation in any way.